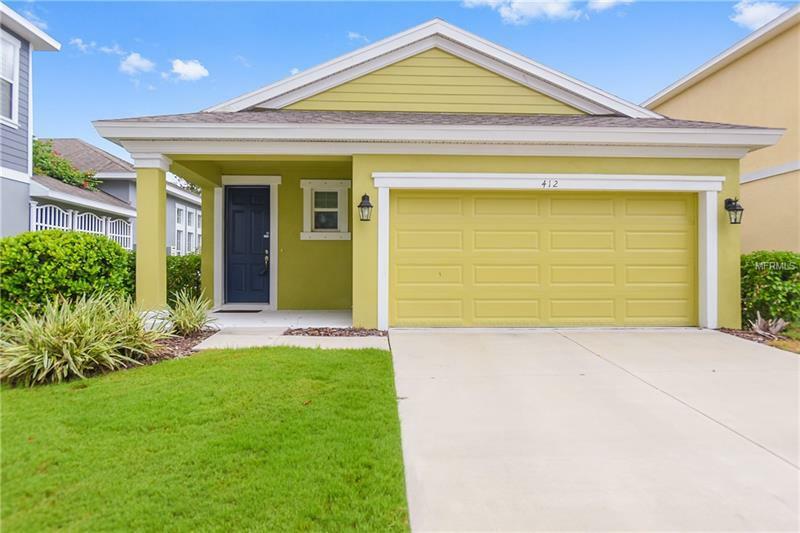 Quaint home in Baybreeze in the WATERFRONT Community of MIRABAY! This popular open concept floor plan beaming with natural lighting was designed for family gatherings and entertaining! Touches such as upgraded tile flooring, wall niches for decor and crown molding really give this home a custom feel! The hardwood floors in the living room gives a warm classic look while carpet in the bedrooms make for cozy toes! The kitchen is a chef's dream featuring wood cabinetry, upgraded back splash, granite countertops, upgraded stainless steel appliances, a gas stove top, recessed lighting, and center island! The master suite has room for a sitting area, recess lighting and a large walk-in closet. The en-suite has dual vanities, granite counter and walk-in shower. The split bedroom plan allows for extra privacy and share a full-bath with a granite counter. The private backyard has a fully covered patio, a perfect place to enjoy your morning cup of coffee or to wind down in the evening with a cool beverage. MiraBay is a gated waterfront premier community offering remarkable resort style amenities including a clubhouse, fitness center, spa services, heated pools, cafe', tennis and basketball courts, parks and playgrounds, community events and much more. The booming town of Apollo Beach has a small town feel, but still conveniently located to all big city attractions. This PRISTINE low maintenance 3 bed, 2 bath, 2 car garage home is awaiting you! Welcome home!